Home/People and Sound/Investigate Marine Animals/How is sound used to study the distribution of marine fishes? Many fishes use sound to attract mates for courtship and spawning. Typically it is the males that produce species-specific low frequency (<500Hz) sounds via the swim bladder – sonic muscle mechanism. Many fishes form large chorusing aggregations nightly during the spawning season and collectively produce sounds well above background levels. Scientists can listen to the nightly vocalizations, identify the species, and document the time and location where spawning occurs. Much of the early work on this topic was conducted by Marie Poland Fish and William H. Mowbray in the northwest Atlantic. Fishes of the Family Gadidae, including cod and haddock, are important in fisheries. 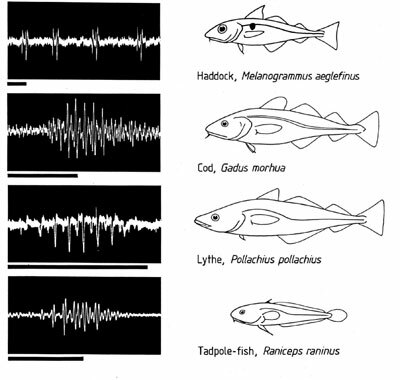 Vocalizations by these fishes have similar frequency ranges, but different pulse characteristics. Scientists have used passive acoustics to discover a large spawning aggregation of haddock in an Arctic fjord in northern Norway. This is the first nearshore spawning site documented for this species. Fishes of the Family Gadidae can be recognized by the unique vocalizations each species produces. Image courtesy of Dr. Rodney Rountree. In Florida and elsewhere, researchers have accurately described the calls of the dominant sound producing species and used this information to study the time and location of spawning. For example, in a Florida estuary, sounds produced by fishes from the Family Sciaenidae show distinct seasonal cycles. The species are also located in specific areas and have been found to use those same areas for over 20 years. Scientists have used the distinct vocalizations made by species of the Family Sciaenidae to study the time and location of their spawning behaviors. The number of vocalizations in each month of the year is shown in a different color for each species (left). The same colors show the spawning locations of the species in a Florida estuary (right). Images courtesy of Dr. Rodney Rountree. Passive acoustic data can be also used to show how the use of spawning habitat changes over time in relation to many variables. For example, many coastal areas continue to be rapidly developed, altering the habitat and changing how rivers flow into estuaries. Time series data on fish sound production may show a change in spawning behavior or location to such habitat changes. This would provide valuable information to resource managers overseeing the effects of development and natural resource policies on the marine environment. Additionally, passive acoustic data on spawning fishes can be used to select the boundaries for marine protected areas (MPA). For example, many species of grouper, a commercially important family of fishes, form spawning aggregations in offshore waters and near reefs. Passive acoustics can be used to determine the timing and location of spawning and if the same locations are used year after year (spawning site fidelity). A number of state agencies (e.g. South Carolina Department of Natural Resources, Florida Fish and Wildlife Conservation Commission) and fisheries scientists have been using passive acoustics to map areas used by spawning fishes. Many recent technical advancements in recording equipment and analysis software are making the application of passive acoustics an increasingly effective tool for studying spawning populations of soniferous fishes. For more information see Acoustic Datalogging Systems. An international workshop on the applications of passive acoustics to fisheries was held by the Massachusetts Institute of Technology Sea Grant in 2002. The following list of benefits of passive acoustics is taken directly from a publication resulting from this workshop. Passive acostics provides a non-invasive, non-destructive census of marine life. It works at night without bias (versus video and other techniques that require light). It can provide continuous monitoring of fishes. It can determine the daily and seasonal activity patterns of fishes, including determination of discrete daily spawning times. It provides a better foundation for the management of exploited species by mapping their distribution and pinpointing their spawning grounds. It offers a better understanding of the habitat preferences of key fish species (e.g., essential fish habitat assessment in the U.S.), providing a better focus for their conservation. It establishes baselines for the abundance and distribution of key species, allowing examination of the effects of future environmental change. It can help us obtain a wider knowledge of the behavior of those fish that cannot readily be studied by any other method. It can be used to monitor environmental noise and determine its source. It can be used to examine the impact of anthropogenic noise on fish, especially on spawning behaviors. Networks of listening posts can provide synoptic data on the occurrence of fishes and spawning activities on local, regional, national, and global scales. NOAA Ocean Explorer: Mating Calls from the Sea. Gilmore, R. G., Jr. (2003). Sound production and communication in the spotted seatrout. In S. Bortone (Ed. ), Biology of the Spotted Seatrout (pp. 177–195). Boca Raton, Florida: CRC Press. Rountree, R. C., Goudey, C., Hawkins, T., Luczkovich, J. J., & Mann, D. A. (2002). Proceedings of Listening to Fish: An international workshop on the applications of passive acoustic applications in marine fisheries. Cambridge, Massachusetts: Massachusetts Institute of Technology Sea Grant.